Chinthy is one of the top R&B/ Hip-Hop star in new generation of Sri Lankan music going where no local star has gone before. Chinthy has amazed Sri Lanka’s music moguls through his debut album titled “Rising from the East” released in 2006 as it was the first of its kind and lots of singles tracks has broken through the curtain like no one has ever expected it will. Form the first album on his success has been rocketed up to high nonetheless it goes on the same as well as growing. These records are but a fraction of the phenomenal success of Chinthy, who has developed over the years into a brand himself. Dubbed by analysts and introduced as the new revolution of the Sri Lankan music industry, Chinthy’s success saw him drawn into a record breaking series of merchandising and marketing campaigns. The change of Chinthy’s image, from maestro to an icon, has seen Sri Lanka experience technological breakthroughs in his many videos and the establishment of a truly household name. His sold out world tour over the last two years has seen Chinthy in venues all across the island and in some of the world’s most celebrated international platforms. 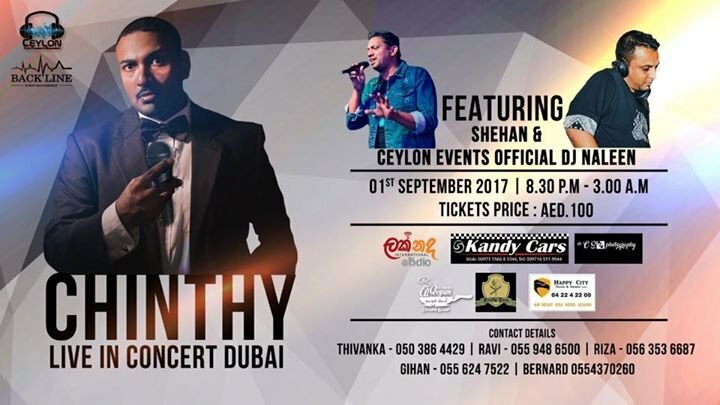 The tour saw Chinthy performing to packed audiences at the Sydney, Melbourne, London, LA, Paris, New York, Cyprus, Korea, Male, Seoul, Doha and Dubai – strengthening his fan base and promoting Sri Lankan music the world over.